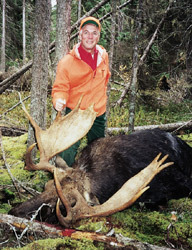 Hunting | Northern Wilderness Outfitters Ltd.
You will need to register your guns at Canada Customs. There is a small fee to do so. You can get these firearm declaration forms ahead of time but do not sign them until you are in the presence of a Canada Customs Officer. These forms are available on-line at www.cfc.ccaf.gc.ca or by calling 1-800-731-4000. * Hunts are to be paid in full upon booking.